Just over two years ago, in January of 2015, while Korea and North America were embroiled in their own battle against HPAI H5N8 (and in North America HPAI H5N2), Taiwan reported finding H5N8 On Goose Farm and `New Strain’ Of H5N2. Almost certainly brought in by migratory birds - the highly promiscuous H5N8 virus quickly reassorted with local avian influenza viruses and produced new versions of H5N2, along with a reassorted H5N3. Their old H5N2 virus remained in circulation, and together these four strains proceeded to wreck havoc on Taiwan's poultry sector. Ten months later, we learned that more than 1,000 farms on the island had been affected, and that Taiwan Culled 5 Million Birds In 2015. While 2015 was (by far) Taiwan's worst year for H5N8/H5N2, these viruses have never really gone away, and scattered outbreaks are still occurring in 2017. Because of this experience, and because Taiwan lies under the same migratory flyway as does Korea and Japan, Taiwan's BAPHIQ (Bureau of Animal Plant Health Inspection & Quarantine) constantly monitors wild and migratory birds for the introduction of new avian viruses (see Taiwan Detects Environmental LPAI H5 & H7 Viruses In Local Wetlands). Today BAPHIQ announced Taiwan's first discovery of HPAI H5N6, which is currently spreading in both Japan and South Korea, in a dead goose near Hualien County’s Yuli Township. Not only are there fears of a repeat of 2015's devastating epizootic, this time the risks of seeing human infections are greater, as H5N6 has infected at least 16 people on the Mainland. First the (translated) statement from Taiwan's BAPHIQ, then I'll return with a bit more. Council of Agriculture Animal and Plant Health Inspection and Quarantine Bureau (CIQ anti) today (6 May) confirmed that China's first in Hualien County Yuli Sanmin farm road leading to the pick-up is eligible for a death Gosling, the detection and analysis, diagnosed as infected with H5N6 highly pathogenic avian influenza (HPAI) virus, which date from October last year just three months, has caused 340 outbreaks in poultry farm in South Korea, a total of nearly culling 33 million birds, hit the country's poultry industry; Japan also has 201 cases detected in wild birds, poultry 10 games incidence, accumulated nearly 1.4 million poultry culled in the display, high infectivity of the virus is highly pathogenic. Thus, anti-CIQ can not be taken lightly, avian flu experts meeting held this morning, the decision of the coping strategies, in addition to strengthening the habitat of migratory birds excrement detection and nearby poultry farm visits, but also to develop and strictly control the movement of monitoring and testing measures. Prevention and Quarantine Bureau particularly serious warning, called for national poultry households should strengthen the hardware and software precautionary measures to prevent the spread of the epidemic Du, resulting in severe epidemics disaster. "The H5N6 bird flu case was commissioned by the Taipei City Wild Bird Society to carry out active surveillance of avian and avian influenza," the defense bureau said. The H5N6 bird flu case picked up a dead young goose on February 2 in the Hualien Yuli field trail, (5) afternoon diagnosed as H5N6 subtype HPAI, preliminary analysis by the animal health, the virus part of the nucleic acid sequence and South Korea, Japan, the outbreak of the virus have a high degree of similarity (the same time, 99%), but its genetic relationship with other avian influenza virus strains, still need to further understand the virus after the whole gene sequence can be determined. Hulian County, animal and plant epidemic prevention in the informed results, then close contact with the Defense Inspection Agency, and yesterday launched the death of the geese source investigation, and start around the area of ​​disinfection measures taken, and give priority to the location around the radius of 1 km 3 duck farms to visit the epidemic situation and found that only 2 ducks breeding, duck health only in good condition, has completed the sampling, the follow-up will be decided by the expert meeting to take a more stringent disposal process on the surrounding radius of 3 Km within the poultry farms, as soon as possible to complete the sampling test, and confirmed by the continued 3 months after the detection of avian influenza virus activity was not lifted in the area of ​​control measures. The expert meeting also decided that within 3 km of the poultry farm, subject to the first detection of virus-free existence before the listing of slaughter; and two weeks (February 21), due to considerations of water poultry avian influenza clinical symptoms were not obvious , In order to avoid possible spread of the epidemic, Hualien region of the waterfowl must be slaughtered in the local, not to other counties and cities; and all poultry before slaughtering, veterinarians are required to do on-site inspection of good health, the opening of poultry health certificate. The live poultry from the field into the Hualien area, poultry vehicles and loading cage must be thoroughly cleaned and disinfected to leave. Taiwan's avian flu outbreak last year was mainly caused by H5N2 and H5N8 subtypes HPAI, a total of 37 poultry farms occurred, killing about 282,000 poultry, the other in the slaughterhouse also detected 17 cases, the epidemic is relatively slow ; This year until February 5 only, poultry field confirmed the killing of about 12,077,778, the virus is still H5N2 and H5N8 subtype HPAI, mainly infected with chickens, the epidemic situation and the same period last year. The H5N6 virus, the first time, shows that Taiwan is located in the migratory path of migratory birds, the new subtype virus invasion risk is high, the Bureau will continue to strengthen the bird flu prevention measures, to prevent new virus invasion and spread. Although the H5N6 subtype of HPAI virus has not yet been detected in domestic poultry farms, it is important to prevent poultry from contact with wild birds in order to effectively prevent the occurrence of poultry in poultry farms. In the process of entrance and exit control, all personnel have to change clothes and shoes, and all kinds of vehicles, cages and utensils must be thoroughly disinfected in order to enhance their self-prevention function and avoid avian flu through different media Spread, and reduce the risk of new virus intrusion and scattered. In addition, the poultry households should also observe the situation of poultry health on a daily basis. If any abnormal death or other warnings are found, the local animal epidemic prevention authorities should be immediately informed and the dead poultry should not be arbitrarily discarded. With the necessary sampling and monitoring, And timely disposal of local epidemic prevention agencies, the common anti-epidemic spread of Du, Breaking the relevant provisions of the feeding and notification will be punished with heavy fines to ensure the safety of poultry industry and sustainable development. 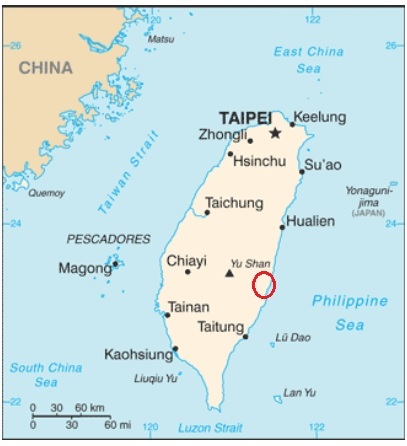 The migratory flyway which has delivered both H5N8 and H5N6 to Taiwan (see map below) - along with an assortment of other LPAI subtypes - is also capable of delivering China's H7N9 virus, which while harmless to chickens, would pose a much greater public health risk. While H7N9 remains restricted to Mainland China, and doesn't appear to spread as readily via migratory birds as do the HPAI H5 viruses, many believe it is just a matter of time before it shows up in Taiwan, Vietnam, Korea, or Japan. Which is why BAPHIQ also posted the following statement on their monitoring for H7N9 as well. The Department of Health (DSD) announced the case of human infection H7N9 from Mainland China. China's current avian influenza in poultry for the H5N2 and H5N8 subtypes, these two types are not infected; there is no H7N9 and H5N6 sub-cases of human transmission of birds. The Council of Agriculture and the Ministry of Health and Welfare held a regular meeting of the Executive Yuan Interagency General Conference on the Prevention and Control of Infectious Diseases and Avian Influenza. For the detection of the virus, the risk of avian transmission was compared with each other, and the epidemic prevention measures were examined. Defense Inspection Bureau will also be published in the official website of the latest international and domestic avian influenza epidemic. According to the defense bureau, China has detected an average of 4,000 samples of migratory birds per year in the habitat of migratory birds. From 1994 to now, two cases of H7N9 subtype avian influenza were detected in 104 years. Once the avian influenza virus , The council will strengthen around the wetland disinfection measures and 3 km around the poultry farm sampling monitoring 3 times, then that is no longer detected H7N9 cases. The two migratory birds were left by the case of animal health analysis, for the general spread of wild birds in the virus branch, does not have high pathogenic virus characteristics, and mainland China Guangdong H7N9 subtype virus is different strains. Bird flu should be handled by birds and virus carriers in order to prevent the risk of human and poultry epidemic. Please take precautions when working. Contact with wild or rearing birds to protect human health. And not to the Chinese mainland to visit or contact the animal farm; return home from the epidemic area, at least a week before they can enter the poultry house, and the other before entering the poultry house should be the first shower, change clothes or disinfection, And poultry health and safety. Usually strengthen the observation of poultry health, if any abnormal alert, should immediately notify the local animal epidemic prevention agencies to assist in dealing with, and with the necessary sampling and testing work to facilitate timely response. The department will also work with the Customs and Excise Department and the Coast Guard to strengthen the investigation and control measures at all ports and airports to prevent illegal smuggling of birds and birds and their products from Hong Kong, Macao and mainland China. While today's announced arrival of H5N6 in Taiwan was far from unexpected, it is another sign that HPAI H5's 2016-2017 World Tour continues to gain momemtum.